Golf enthusiasts or fans of Tiger Woods, which I am part of the latter, are excited that it seems the Tiger Woods of 2005 is back. Why 2005? 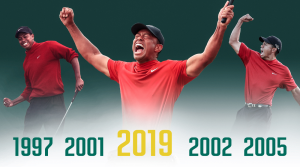 2005 was the last year that Tiger Woods won The Masters Tournament. Not only are golf enthusiasts and Tiger fans excited, but CBS and their advertisers are excited because professional golf ratings are much higher when Tiger is in the hunt on Sundays than Sundays when he is not playing in the final round. So this past weekend was really exciting to watch, as Tiger won his fifth “Green Jacket” at The Masters Tournament. As I watched The Masters Tournament this weekend, I believe Tigers Wood’s performance gives us three lessons on Retirement Planning. It is never too late– After taking a hiatus from professional golf, after four major back surgeries and even after falling to his lowest career ranking since turning professional many said it was over for Tiger Woods and golf. Personal struggles, physical inabilities and lack of confidence from the general public all combined seemed to be the demise of arguably the greatest golfer ever. However, over the last twelve months we have seen Tiger Woods go from ranking #1199 in the World Golf Ranking in December of 2017 to rising over 1000 places to be ranked #12 before this year’s Master. Just like Tiger Woods has shown that even after divorce, career issues and everything you once knew being turned upside it is never too late for your future to be better than your past. For many pre-retirees, they feel planning for retirement is not realistic for them. Why? Because for them they may have been downsized, filed bankruptcy, faced foreclosure, started after everyone else and a thousand other reasons which is why many pre-retirees feel hopeless about their retirement future. The good news is it is never too late to plan and prepare for your retirement and I can show you how. Give me a call at our office 615-678-6603 and or visit our website for a complimentary no obligation Retirement Income analysis. Let us help you formulate a strategy that will put you on the right track in achieving your retirement and financial goals for you and those you love. Don’t quit- From 2009-2017 there were many pundits, commentators and even some fans who believed that Tiger Woods should just call it quits. They said he is a shell of himself, he will never return to the elite level he once mastered and that the game had passed him by. To preserve whatever legacy he had left, it would be to his benefit to just quit. However, when you look at what he has accomplished in the last 12 months those same pundits, commentators and so called “fans” have changed their tune. How many pre-retirees feel that because they have waited too late to plan or because they do not have the six or seven figure dollar retirement plan balance that they should “quit while they are ahead?” I want to encourage you today by sharing with you, from our experience, many people do not seriously start investing and planning for their retirement until they are early to late fifties. That does not mean they do not have retirement savings accumulated, but it does provide the motivation to keep pushing toward your retirement savings goal because early to late fifties is when most pre-retirees reach their highest earning levels during their working years. This highest earning level allows them the ability to invest more dollars toward their retirement savings plan. If you would like for us to review your current Investment plan or need help in creating one please give us a call 615-678-6603 or visit our website to schedule a no-obligation Investment Plan analysis. You need a Caddie- Joe LaCava, the caddie for Tiger Woods, came onto the bag of Tiger Woods after his acrimonious split with former bagman Steve Williams, who had worked for Woods for 13 years. Jo LaCava has been working for the 14-time major winner since 2011. Joe LaCava made his name as a caddie while working for Fred Couples in the 90s and early 2000s. In fact, he spent 20 years working for the 1992 US Masters Champion and helped Couples win a total of 12 events. The two split when Couples told LaCava to go and work for a younger player. But what is a caddie and why do we all need one in this financial game called retirement? In golf, a caddie (or caddy) is the person who carries a player’s bag and clubs, and gives insightful advice and moral support. A good caddie is aware of the challenges and obstacles of the golf course being played, along with the best strategy in playing it. This includes knowing overall yardage, pin placements and club selection. Before and especially in retirement, we all need a “Retirement Income Caddie” who can give us insightful advice and moral support as we make the right decisions regarding our future like: What do I do with my retirement account when I retire? How do I go about taking money out of my retirement accounts and in what order? What decisions should I make regarding my life insurance and health insurance during retirement? What options should I select regarding my pension and Social Security benefits? All of these questions and so many more can be answered by a competent “Retirement Income Caddie”. Also in golf, a caddie is aware of the challenges and obstacles of the gold course being played along with the best strategy in playing it. A “Retirement Income Caddie” should be able to help you navigate the road to and through retirement properly through a well thought out and developed retirement income plan addressing those challenges and obstacles you will face in the future. If you would like us to serve as your “Retirement Income Caddie” we would love the opportunity to walk side by side with you on your retirement planning journey. These are the three lessons we can learn from Tiger Woods and his winning the 2019 Masters Tournament 1) It’s never too late 2) Do not quit 3) You need a “Retirement Income Caddie. Let us help you win at this financial game called Retirement. October Effect. Where Do We Go From Here?